I’ve been looking at this for too long. Lord knows I love completist infographics. 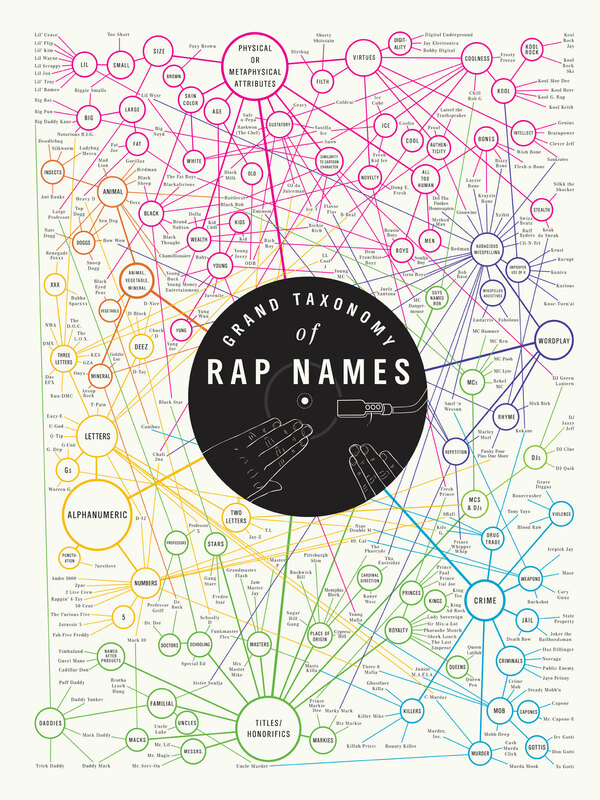 The Grand Taxonomy of Rap Names. A beautiful composition built upon looping with an RC 50 Loopstation. John’s website is here. His technique actually looks like he’s playing a bass at times; he titles it an Latin-Asian composition, which I guess it is- I’ll let a man who’s developed this level of skill define his own genre. I think there’s going to be a whole new explosion of looping players, no matter their instrument, that come out in the next 5 years that blow people away. Much like there being an entire generation who’s chosen medium is film-making that will revolutionize cinema (which I already think you’re seeing the first sparks of with Zombieland, Scott Pilgrim and their ilk, playing with film-as-canvas the way Peter Greenaway did), there’s going to be guitarists that learned by endlessly jamming with themselves via loopers. You don’t have to wait for your bassist or drummer to be on time. Here’s a loop, a spare 3 hours, a trance-like bed to play over, and they’re soloing for hours, developing their craft like Coltrane running scales forwards, backwards and all other variations, driving his New York neighbors crazy. Les Claypool-like cascading sheets of notes. And when game companies figure out a way to bridge the gap between Rock Band/Guitar Hero games and actual musical instruction (it’s really close now, just a nudge before we’re there) as a enjoyable, immersive experience, well, the sky’s the limit, really.